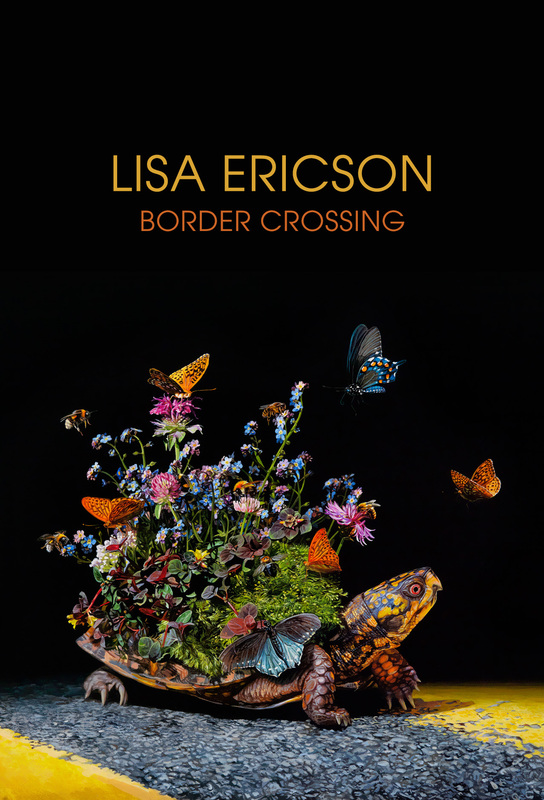 Thinkspace is pleased to present Border Crossing, featuring new works by Portland-based artist Lisa Ericson. 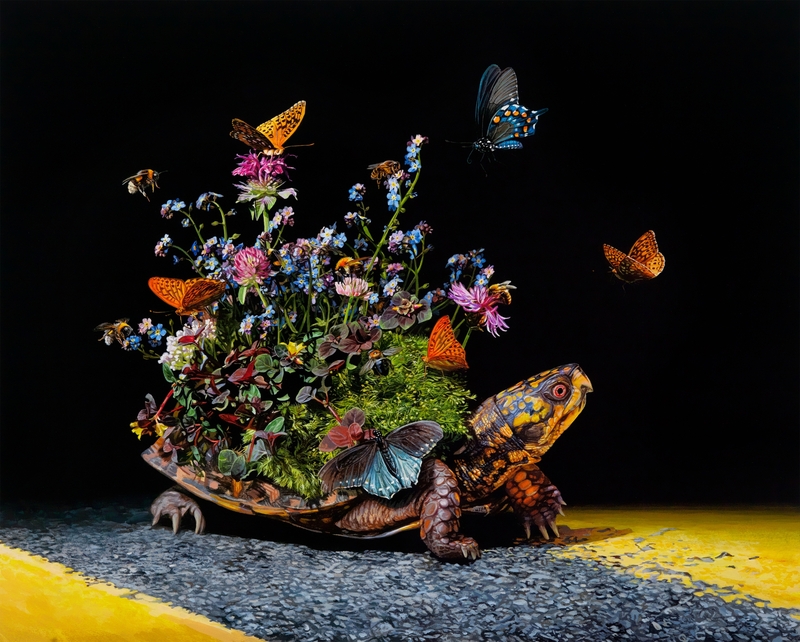 Her meticulous rendered, hyperrealistic paintings are a wonderland where parasitical ecosystems are perched weightlessly on the backs of wildlife and the breathtaking details are a wonderland for the viewer. 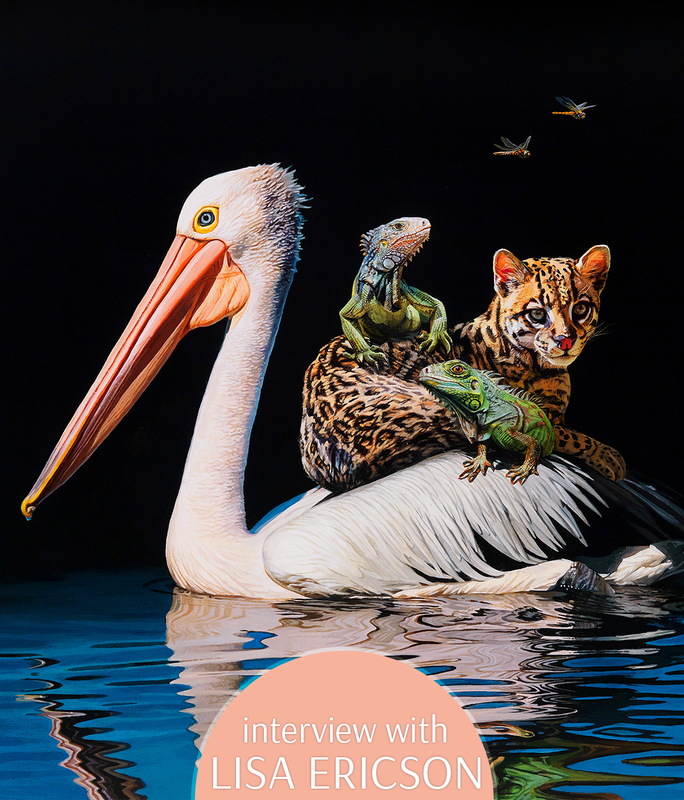 In anticipation of Border Crossing, our interview with Lisa Ericson discusses the exhibitions challenging work, reincarnation, and how she will be celebrating the completion of this new body of work. Join us Saturday, October 13th from 6 pm to 9 pm for the opening reception of Border Crossing. SH: What is the inspiration behind the Border Crossing? LE: A couple different ideas were swimming around together in my mind…migration, immigration, refugees, wildlife corridors. 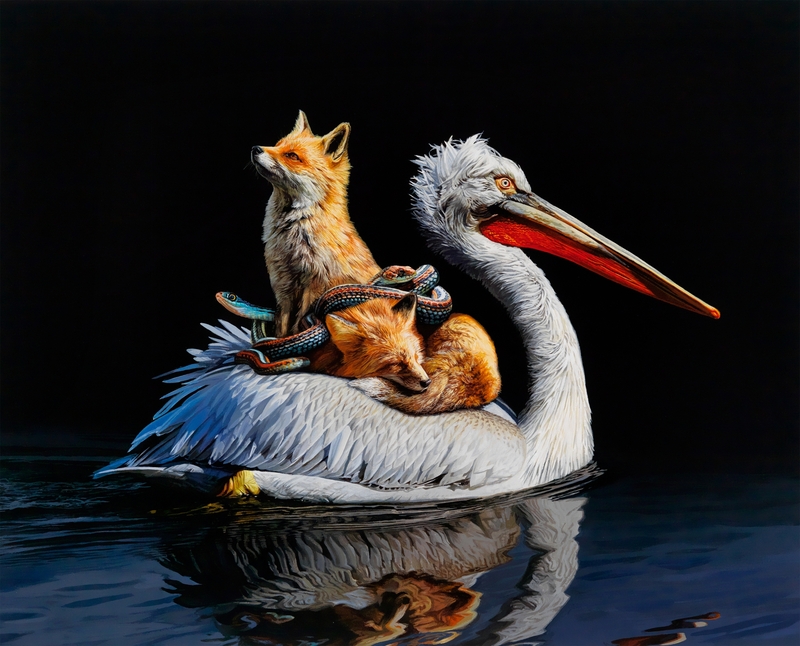 Often I intertwine human & animal inspiration so the final piece can be read as both a human tale or an animal one. LE: I don’t map out the entire thing from the start. I never have more than one or two pieces completely planned at a time. I start with an idea and put together images for the first couple of paintings, but leave space while I’m working on those pieces for the original idea branch out in my mind. One piece leads to the next and so on. I’ve learned to trust that. LE: I don’t really work in a sketchbook. As ideas pop into my head, I jot them down or do tiny sketches on whatever piece of paper is handy. Bare bones stuff, but a kernel to start from. Later when I start putting together a composite image of a future painting, the idea either flies or dies. But even if it dies, often a new and better idea is born out of it. Some ideas come together quickly. Others I try repeatedly, but I can’t get them to work. Some of those eventually click and become paintings. Some are still just floating around in my head. SH: What excites you and frustrates you about your work / creative process? LE: This question makes me dive right down into my psyche and confront my best/worst qualities. The same thing excites and frustrates me about my process. I start every show at a glacial pace. The first couple paintings take ages to conceptualize and execute. But as the show date come closer and the pressure crystalizes the ideas in my head, I take less and less time from idea to finished piece, I work longer and longer hours until I end at an all-consuming frenzy. After every show, I make promises about pacing myself. I make time charts. But then I repeat the same pattern. Part of me realizes that the pressure is part of what makes me tick, and in some ways, I thrive on it and even enjoy it. But I still try to tell myself I’ll be different the next time around. LE: I made “Into the Dark” in response to the horror of the policy of separating children from their parents at the U.S. border. A mother lemur’s babies cling to her, the way a human child would, the way my own daughter clings to me. Often when I work, I get lost in the technical aspects of painting – the color, seeing the image take shape brushstroke by brushstroke – but this subject matter was a little raw for me and I felt emotional about it all the way through. SH: If you were reincarnated as an animal, what do you think you’d come back as and why? Is that the same as what you would want to be reincarnated as? LE: I think I’d be reincarnated as something wary and shy, and happy to stay in her burrow. No doubt why I do well as a painter, spending long periods of time alone in my studio. But I’d want to be reincarnated as a bird. Because, flight! I have an irrational fear of flying in planes. I still do it, but am always filled with anxiety about it. I’d love to be free of that. SH: Who is an artist; musician, director, any art form – who would be a dream collaboration for you and what would you create? Maybe a muralist? LE: I work on small, minutely detailed paintings, but I love murals and art in the public space of all kinds. I’d love to see something of mine in a huge format on a wall or side of a building. SH: Favorite way to celebrate the completion of a project/body of work. LE: First, sleep. Oh, glorious sleep. Then I let friends know that I’m once again available to have a social life (because no doubt I’ve been in studio lockdown for months). I catch up on life. I clean my studio (and then find it sterile and empty and must make it messy again). It’s all a cycle! Concurrently on view in the Thinkspace project room are new works by Portland-based artist Lisa Ericson in Border Crossing. Ericson’s meticulously rendered, hyperrealistic paintings are executed in acrylic on panel with the use of minute detailing brushes. She depicts supernatural amalgams of wild animals, everything from the surreal winged rodents she’s fondly coined ‘mouser-flies,’ to entire, parasitical ecosystems perched weightlessly upon the backs of other creatures, each dramatically set against pitch black backgrounds. Technically breathtaking, the works are optically dizzying in their depth, color, intensity, and contrast. 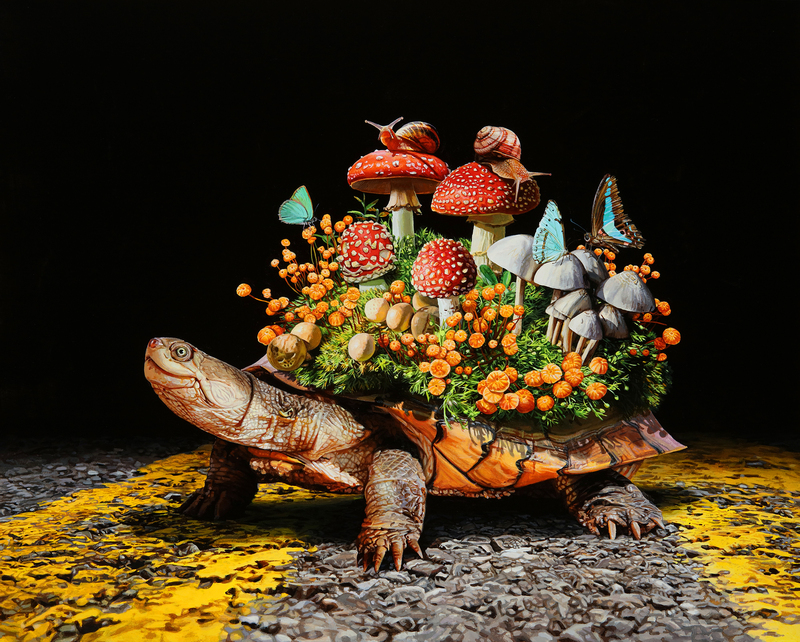 In Ericson’s universe visual poetry abounds: a tree of monarchs emerges fantastically from the shell of a placid turtle host, while an entire miniature coral reef drags close behind on a beta’s fins. Ericson’s works playfully consider the order and balance of natural bodies and systems through their reconfiguration. Recognizing the delicacy and interdependence of all natural infrastructures, the artist plays with their improbable remix, altering proportion and scale to fictional extremes. Through the creation of often whimsical hybrids, she considers the beginnings and ends of individual boundaries and collective frontiers, looking to the generative potential of thresholds and crossovers. Through the recombination of familiar parts, entirely new, beautifully abhorrent travelers are brought to life in Ericson’s composite creature worlds.